For three weeks in a row the going number of links at the party has been around 459. Strange that it ends on that number. I am just so glad to have y'all joining each week. Let's look at the top three most viewed links. 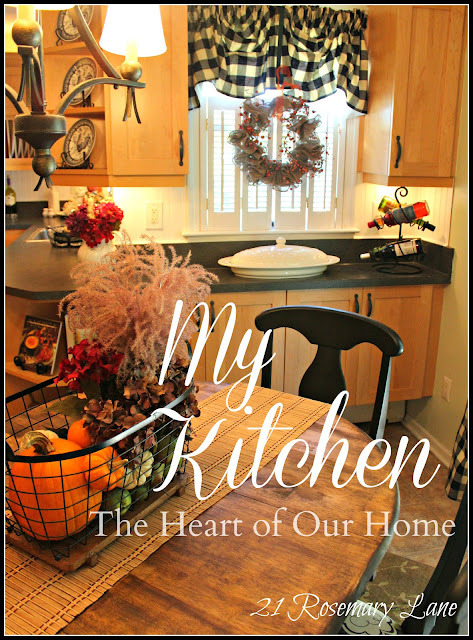 21 Rosemary Lane had 460 views by sharing her gorgeous kitchen. We all love to tour kitchens. Well, KariAnne has gone and done it again and came in second for the third week in a row. She really should quit hogging the second spot now shouldn't she? Of course we love her home and just look at this beautiful magazine worthy bedroom. She had over 337 views. Coming in third with over 267 views is House Talkn who took us on a cottage tour around her neighborhood. If you were featured and don't already have a "featured" button you can grab one from my sidebar. Can't wait to see what you have to share tonight at the Wow party. Great features Kim! See ya tonight! Quit hogging the top 3 Karianne :) Kidding...always gorgeous! 21 Rosemary Lane's kitchen is amazing too...heading over to check out the cottage tour. Thank you so much Kim for posting your top three...I am just thrilled to be included with the other such gorgeous posts. Wishing you a wonderful day and fabulous week! Morning, Kimmie! Well, these features sure make me drool! They are all so beautiful! I love seeing which posts were the top three each week...in case I happened to miss some! Always such great projects and ideas linked up to your parties, Kim. See you tonight. Beautiful features! I can see why each one received so many views! Thanks for sharing Kim...Went to Kari Annes post this morning and read about a roast she made. I laughed so hard! The funnest post! Oh, my goodness! Thank you for coming along on a cottage walk through my 'hood! Thank you for being the hostess with the mostest, Kim! Stands to reason why they were the top three...they are fabulous!! !.